Gina Schaefer is the Co-Founder and CEO of 12 Ace Hardware stores located in Washington, DC Baltimore, MD and Alexandria, VA.
Gina is a passionate entrepreneur who grew her company from one to eleven stores in a twelve year period, and with her husband leads a multi-million dollar small business that employs 260 people. Not one to be stumped by convention, Gina challenges the male-dominated hardware industry to think well outside the box. Her motto – “born and original, don’t die a copy” is evident in her passion for urban markets, small business, and the ability for women to succeed in all aspects of the hardware industry. 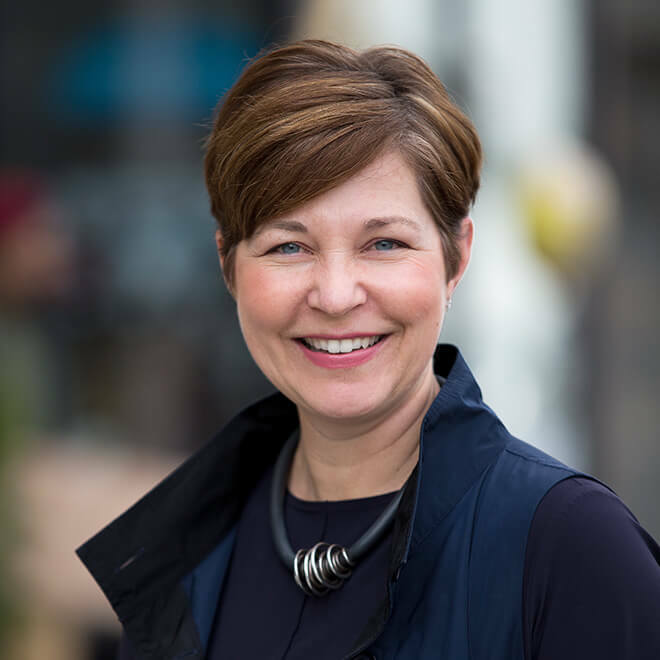 Gina has tirelessly focused on the “Return to Main Street” movement in her own city of Washington D.C. to promote Shop Local campaigns and community revitalization projects in urban areas. This has resulted in partnering with many local entrepreneurs and creating a D.C.-based program to sell locally made goods from prime shelf space in her stores. She serves on the CCA Global Partners, Inc. Board of Directors and is a member of the Ace Center for Excellence. She serves on the non-profit boards of House of Ruth, Jubilee Jobs, and the Institute for Local Self-Reliance.